Poet Ilya Kaminsky: My response is: gratitude. I think she did a marvelous job. Artist Elizabeth Terhune: I liked the head being banged on the ground. It immediately made sense to me (I do that with my own head, in drawings and fairly regularly at other times). And then, the hard and furious laughter. The poem is full of quick turns like this. They’re interesting. I felt comfortable. For me, the poem describes a moment of self-consciousness—and the progression that takes place through awareness, facing intense feelings. I also like the focus on the mouth. Laughter, pepper vodka, lip reading, a feather on the tongue. It seems a rich, odd physicality. If you imagine a feather on your tongue it is like how you are taught to sound out words when learning to read. The pepper vodka. A scrutiny of the mouth and throat. Ultimately arriving at the grace of thankfulness, I think the poem tilts into balance through honesty. Laughter is both a dilution of despair and a poverty. The poem chooses navigation over stasis. The move is towards getting deeper. Poet Ilya Kaminsky: There was, I think, more jubilation. Which is only a good thing. Something for me to learn. Poet Ilya Kaminsky: I learned to look for more Spring at the end of February, I think. Artist Elizabeth Terhune: I was surprised by what I didn’t do. 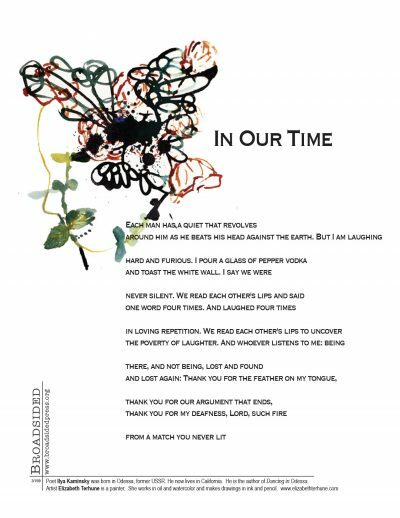 When this poem was sent out to the Broadsided artists, I made myself wait a few days to give someone else the opportunity to do the art. It was a difficult wait, and at last I jumped. Of course, then I thought, “Oh no, now what?” Then, within eight days of reading the poem I did the drawing. It took six more months to think about it. I opted to let the drawing be less perfect in its match of the poem—which is a real departure for me. The feather on the tongue became a plant (if you look closely you can see the veins in the plant leaf which started as the feather). The deafness/fire from the unlit match became the churning growth of flowers and an ink splatter. I tried to match the feelings, the inwardness, the quiet affirmation, but was less insistent on image-to-image correspondence. Poet Ilya Kaminsky: Yes, Mr. Marc Chagall and Mr. Rembrant have been whispering. I try to listen. One always feels gratitude to be in presence of their greater sprits. Light and darkness in Rembrant are our own. And, all that flying in Chagall, well, one can’t fly. But one wants Chagall to teach us. Artist Elizabeth Terhune: The image of a head seemed very strong, and heads had entered my work a few months prior to my working on this poem. The poem offers a variety—the despairing head, beaten against the earth, the head tossing back vodka, the toasting head, the laughing head, two heads lip reading, the head with a feather on its tongue—and my impulse from the start was to capture something of the mystery of this poem in an image. If you had to represent the Broadsided collaboration of “In Our Time” with one word, what would it be? Artist Elizabeth Terhune: I couldn’t do that. The only thought I have is to ask what is the term for the small feathers that are the equivalent to the guard hairs of an animal’s coat. Artist Elizabeth Terhune: I’ve basically not stopped talking about reading the biography of Emily Dickinson, The Life of Emily Dickinson by Richard B. Sewall. An 800 page gem. Working on “In Our Time” inspired me to purchase and read Mr. Kaminsky’s book, Dancing in Odessa. A truly wonderful book, many times through. Poet Ilya Kaminsky: Anna Swir, Talking to my body. Artist Elizabeth Terhune: Morandi. Van Gogh. Mary Heilman. Elizabeth Peyton. I could go on, this is NYC. Poet Ilya Kaminsky: A lot of good new artists at Vermont Studio Center. Really, quite wonderful. Artist Elizabeth Terhune: It occurred and occurs to me that I’ve misread the poem. Initially I thought there was one person, then I thought there are two people, and that it was a love poem, and then I thought, no, it’s only one person with their thoughts. I read the “we” as the narrator being with his shadow or reflection. The argument that ends is with God. This is a strange way to feel, but there you are. Thank you to Ilya Kaminsky for the poem, and Liz and Mark at Broadsided. Vectors and readers, and Broadsided art lookers, you are deeply appreciated. Thank you. Poet Ilya Kaminsky is the author of Dancing In Odessa which won Whiting Writers Award, American Academy of Arts and Letters’ Metcalf Award, Dorset Prize, Ruth Lilly Fellowship from Poetry magazine. It was also named the Best Poetry Book of 2005 by ForeWord magazine. Artist Elizabeth Terhune received her MFA from Hunter College and her BA from Oberlin College. She was the recipient of a Yaddo Fellowship in 1998. She has exhibited widely throughout the United States and recently had a one-person exhibition at the Lake George Arts Project, Lake George, NY. Image: watercolor, 2″ (h) 11-1/2″ (w).